Save Additional $404.70 When Paying With Bank Wire. You pay $13,085.30. Silver diall with engine turned central atlas motif, black Roman numerals, raised rotatable outer chapter with 24-hour day and night indication, further outer rotatable chapter with 24 world cities, blued steel Breguet hands and centre seconds, date aperture at 6. Brown leather strap with 18K yellow gold deployant buckle. 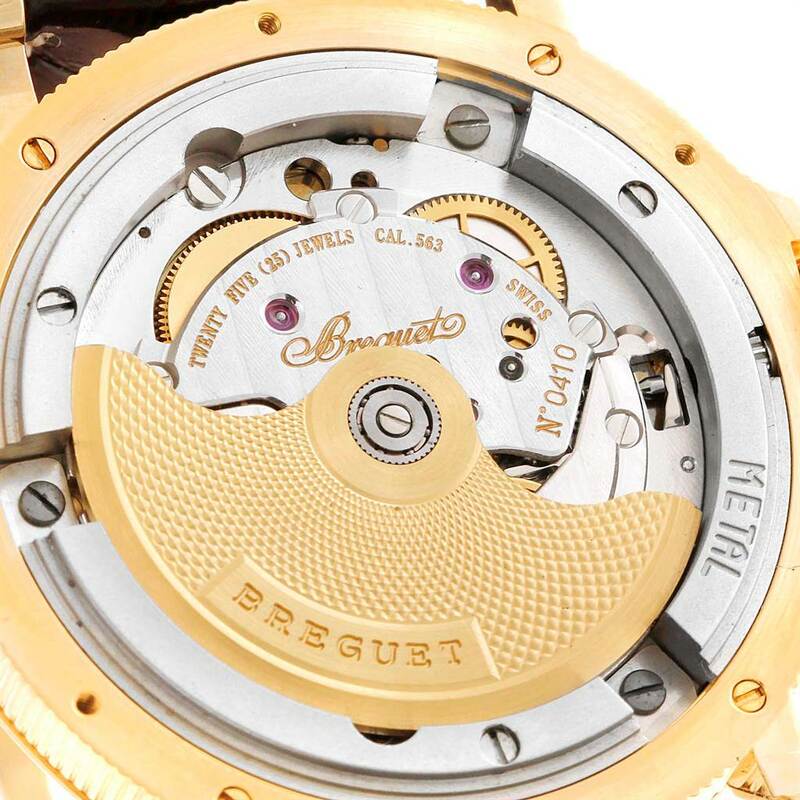 Breguet Marine Hora Mundi 24 World Time Zones Yellow Gold Watch 3700. Automatic self-winding movement. Rhodium-plated, fausses cotes decoration, 36 jewels, straight-line lever escapement, monometallic balance, shock absorber, self-compensating flat balance spring, 21K gold rotor. 18K yellow gold case 38.0 mm in diameter. Scratch resistant sapphire crystal. Silvered dial, central disc with meridians and parallels, surrounded by a plain silver 12-hour ring dial with painted radial Roman numerals and a revolving 24-hour ring for the second time zone with Arabic numerals, outermost silver ring bearing the names of 24 cities in the world, rotated with the inner crown, aperture for the date. Blued Breguet hands. 18K yellow gold stepped bezel. Brown leather strap with 18K yellow gold deployant buckle.